Feather Bloom is by the great and famous grand prix jumper Mr Blue Preferent out of Prelude Keur Sport EPTM by Calvados Keur . Born in 2010 she stands 16.1 hands . Feather was imported in utero from Holland and is one of our most treasure mare being the daughter of Prelude Keur Sport Prestatie. She showed great athletic power and as a foal was Champion of her keuring and Reserve Champion of the entire North American KWPN tour. Her bloodline is packed with the best performance stallions and mares Europe had to offer. 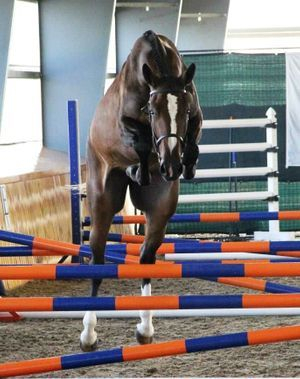 Her first two offspring were KWPN Reserve Champion jumper in North America. Mr BLUE had an outstanding career in Grand Prix around the globe. In 2006, five years after his death, he was awarded the Preferent Predicate awarded only to the most influencial and outstanding stallions. Mr Blue has strong influences in the show jumping sport. He has produced 38 approved stallions such as Zirocco Blue and Pilot Blue, winner of the 2010 World Cup Finals. 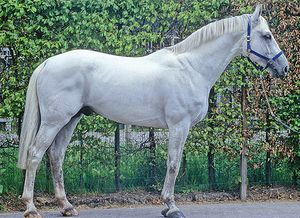 Mr Blue is a highly influential stallion who is best known for passing along good temperaments, blood and strong bone structure to his offspring.